Poznan Supercomputing and Networking Centre (PSNC), Poland. 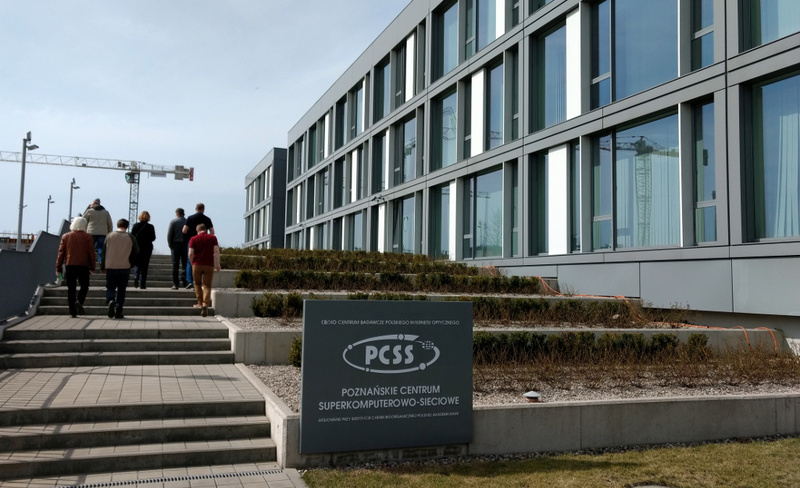 From the 3rd to the 13th of April, our fusion group has participated in the Code Camp of the EUROfusion “Code Development for Integrated Modelling” (WPCD) Work Package at Poznan Supercomputing and Networking Centre (PSNC), Poznan, Poland. WPCD develops generic and flexible sophisticated workflows for physics applications, aiming at providing a validated modular suite for the simulation of complete plasma discharges of any existing and future tokamak, including JET, JT-60SA, ITER and DEMO. The activities performed at the Code Camp were in line with the main 2018 WPCD milestones, namely the adaptation of codes and released workflows to the ITER Integrated Modelling & Analysis Suite (IMAS) and specifically the demonstration of a core plasma workflow in IMAS, turbulence and synthetic diagnostics workflow, as well as the prototyping of control workflows. IMAS will support both plasma operation and research activities on the ITER tokamak experiment. Xavier Sáez and Mervi Mantsinen worked in the PION integration into IMAS Kepler workflow. In the meetings, it was decided what the inputs/outputs to/from PION are used to integrate it into the Heating and Current Drive (HCD) workflow. This was a necessary step to create a PION actor for the HCD workflow. Albert Gutiérrez continued the development of his EUROfusion Engineering Grant project in close interaction with the PSNC members of the WPCD Core Programming Team. Edgar Olivares supported Albert’s work and started a collaboration based on ASCOT code, a Monte Carlo code for fast particles in tokamak plasmas. The help of Jari Varje, one of ASCOT developers, was valuable to understand the behaviour of the code and learn how to post-process the output data. During the Code Camp, our members could attend a guided tour organized by PSNC to visit several very interesting laboratories, the data centre and the Eagle supercomputer.